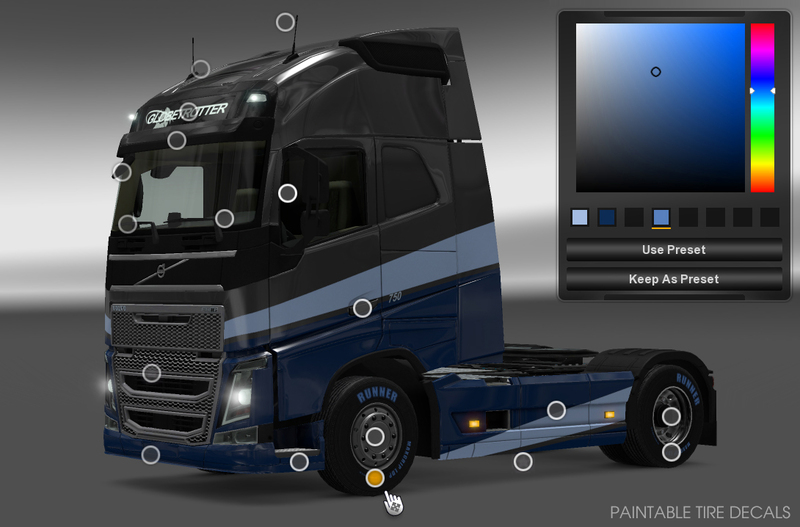 Update 1.22 for Euro Truck Simulator 2 is entering Open Beta on Steam today. The update comes with a ton of improvements and fixes (see below), but for us the central new feature are Contracts - a new kind of jobs available from World of Trucks. During this public beta we will be testing the robustness of our server infrastructure, and watching for errors across the job-dispensing system. As always, we are looking looking forward to your feedback and reports of any bugs you may help us find. The new feature is implemented both in the game "client" as well as on the World of Trucks servers. 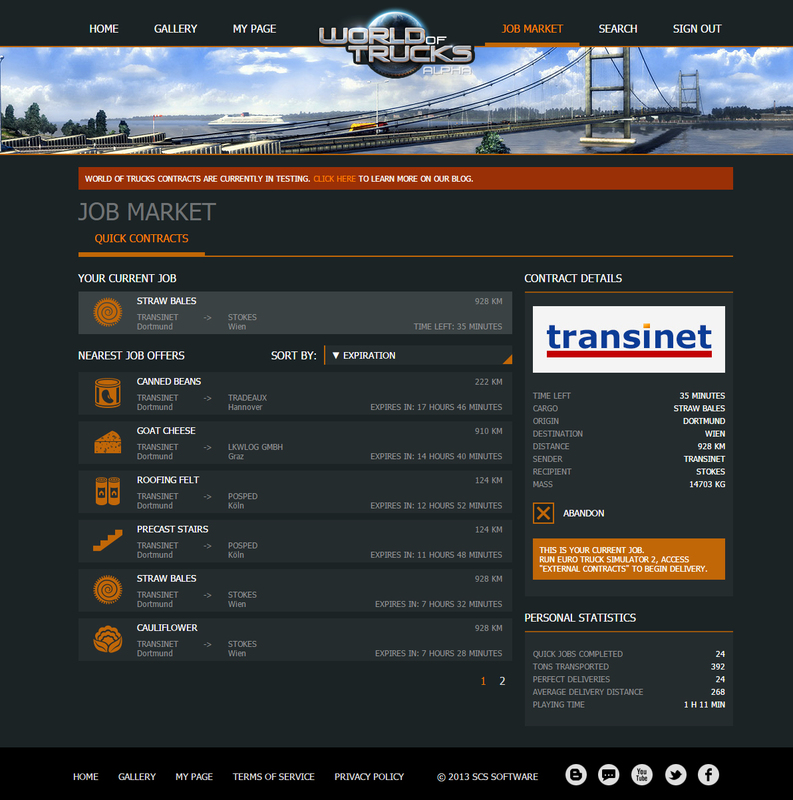 The first thing you will see after accessing World Of Trucks Job Market screen is city selection dialog. Contracts are actually the first in a series of steps to create parallel gameplay to what we have now working in the standard single-player game. Contract jobs are handled separately, your vehicle's position while on a Contract is also tracked and stored independently of existing standard game jobs under way. The Contracts system will let you choose where you want to start your journey in this alternate game experience. We have received numerous questions on why are we even venturing into this direction when there are so many other game features to implement that we could and should pursue. Looking at Contracts in isolation, they are indeed not a game changer. But as the saying goes, Rome wasn't built in a day. Our long-term vision is to create a complex new meta-game on top of the existing game with online gameplay, rich economy, RPG elements, virtual trucking companies, and eventually multiplayer support. To get from point A to point B, we'll need to pass a lot of milestones, test out many things, and we would be happy to have you along for the ride. The current implementation of Contracts is just the first of several steps that we are working on. During the beta period, depending on severity of any bugs discovered, we may touch the core of contracts generation mechanisms. Please be aware that all stats gathered during the beta period will be wiped before the final 1.22 update is made public. But there are way more changes coming with Update 1.22. Another feature worth highlighting is extension of the simulation to cover European tyre grading system. Along with it comes a little cosmetic improvement that will allow the players to apply color to designated parts of the tyre. In fact this too is only a start of a more extensive push to have richer customization options for wheels, with more cool stuff being prepared for future game updates.